The eighth day of our safari was the early rise day, since many of us were going to take the sunrise hot air balloon ride over the Serengeti. We did this last year and offered the same experience this time around. And once again, it did not disappoint. I was happy to hear that they had three balloons going up on this morning. This gave us the chance to photograph the other balloons from ours. I requested that we be the first one in the air, and they were nice enough to oblige. This gave us the photo opportunity to get shots of the other balloons against the sunrise. For this shot, I waited until both other pilots fired their gas tanks to light the lower part of their balloons. Unlike last year when I took two cameras and lenses, this year I took only one camera and lens with me. I took the Canon 5D Mark IV with the Canon 24-70mm lens. Just as the other balloons took off, we were greeted by the rising sun. How beautiful is this? I recommended that our guests turn and look the other direction as well. (Photographer's note: It is always a good idea to look in all directions when taking photos. You may be surprised by what you see.) Looking this way gave us a nice view of the shadow of our own balloon on the plains of the Serengeti. I saw Mike shooting photos looking up at the canopy of the balloon. I had him move a little to one side, and then with me moving a little as well, I was able to get this photo with the illusion of the flame coming directly out of his lens. I sent this photo to a couple of my friends at Canon and said "Your 70-200mm 2.8 lens is so hot!" As we rose higher into the air, it was cool to look down and see the long shadows from all the acacia trees. Unlike last year, we went directly over one of the tent lodges, and made sure to wave to all the people down on the ground. At one point, we were paralleling these wildebeests as they ran along the plains. I took a couple of "safe shots" at 1/1000 sec and then thought that it would be fun to try and motion pan with them, since we were moving at roughly the same speed as they were running. I was already at ISO 100, so I quickly changed my aperture to f/20, which gave me a shutter speed of 1/13 sec. 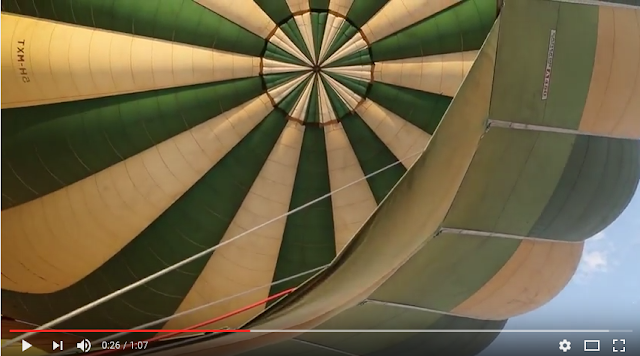 Here is a short video taken from the hot air balloon. After we landed, we had a really nice breakfast out on the plains and then headed back to meet up with the rest of our guests. Then it was time to continue our game drive. On this morning, we came across a really large group of wildebeest and zebra who had congregated by a local water hole. Right now, Tanzania is in the middle of a drought, so the animals have no choice but to come to the same water. I shot some video with the Canon 1Dx Mark II for you to see. This will give you a good idea of what it is like to be out in the wild with all these creatures. This is why we bring guests to Tanzania in January, as it is a great time to witness the reverse migration and the young animals. We watched as some of the wildebeest crossed the water. Once on the other side of the water, the wildebeest would run off. 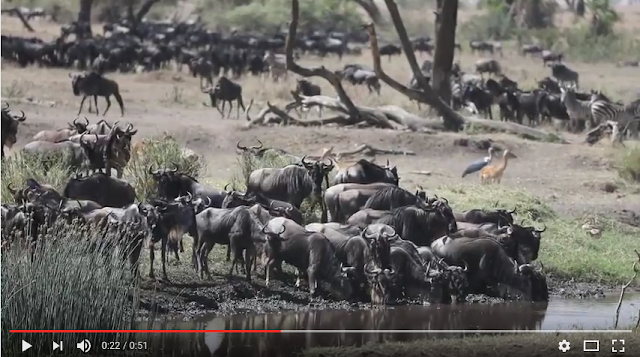 I quickly changed the settings of the Canon 5D Mark IV to ISO 100, f/25, 1/40 sec and panned with the wildebeest, like I had done earlier in the morning from the balloon. I also tried using the slow shutter speed to isolate this one young zebra. For this shot to work, I needed the zebra to be standing completely still, but have the other animals in motion around it. We saw these gazelle drinking from the water hole and then noticed the dead wildebeest in the water. It turns out that the mud is really thick and some of the animals get stuck in the mud and die. As we were driving away from the watering hole, we saw these zebras all bunched up and blocking the road. I waited for them to separate a bit, and the middle zebra to look forward, and grabbed this shot. Once home, I decided to convert the same photo to black & white using Nik SilverEfex Pro. I think I like the B&W version better. What about you? We saw this group of hippos sunning themselves. Even though we had seen countless giraffe over the last 3 or 4 days, we were able to get really close to this one, and I took advantage of the proximity to get a tight shot of the giraffe eating from the acacia tree. We took a lunch break and then drove to the hippo pond. If you read the blog last year, you may remember that this pond was a heavily flowing river with hundreds of active hippos. Not this year! This year it was a small puddle and the hippos were really dormant. We still got some photos of the hippos, but not as active as last year. This just goes to show you how different each safari can be. I love that no two trips to Africa are alike. Yeah - I probably don't need to say anything here...do I? Along the road from the hippo pond, we came across this Dik Dik. Looking at their eyes, it makes you wonder if this is where Disney came up with the idea for their "Bambi eyes". This year we did not see that many Topi, but we got some photos of these animals in the late afternoon light. We were close to our tent camp when we saw this large group of baboons, including a bunch of babies. They were really cute, the way that they were riding on the adults. I had never seen one ride like this before, straight up on the back. Their front end looks better than their back end. The sun was really low, which made for perfect portrait lighting. I saw this baboon looking right at me and directly into the light, and loved the lighting in his eyes. ...and Godwin... All amazing guys. And lastly, I took a photo of the three guys together. You might think that these are "just guides" but they are so much more. You have to remember that we spend 2 weeks a year with these guys and they make or break the trip. They are our pilots, our nature experts, our tour guides and most importantly, our friends. I can tell you this...each year we have the same experience with our guests. We ask them for the highlights of their trip, and inevitably, the drivers are at the top of that list! Stay tuned for Day 9 and the remaining days of our trip. And also, remember that you and your friends can enter your email address at the top right of this blog to get an email any time I write a new blog post. 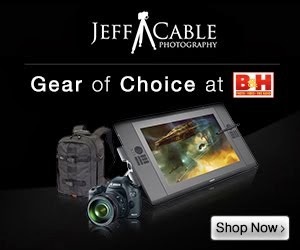 If you are interested in purchasing ANY equipment, please click here to go to B&H Photo, as I get a referral from them if you enter this way. It does not change the cost to you in any way, but it helps me keep this blog up and running. Check out my upcoming photo tours to amazing places around the world. That looks like a ton of fun. Good photos as well. Get this blog delivered right to your email! Enter your email address here. Copyright Jeff Cable Photography. All rights reserved - . Simple theme. Powered by Blogger.